William O'Domhnuill (d.1628), known also as William Daniel, Archbishop of Tuam was a native of Kilkenny and his name appears in the patent (3 March 1592) for the foundation of Trinity College, Dublin. It was while at that College that William took up the work of translating The New Testament - Tiomna Nuadh into Irish. This work was begun by Nicolas Walsh, Bishop of Ossory, who was murdered in 1585, and afterwards it was continued by John Kearney (who translated and published the first Irish Catechism, printed in Dublin in 1571), and Nehemias Donellan, Archbishop of Tuam in 1595. The merit of first giving to the press, in the native language of the country, a version of the Sacred Scriptures, belongs clearly to Trinity College. 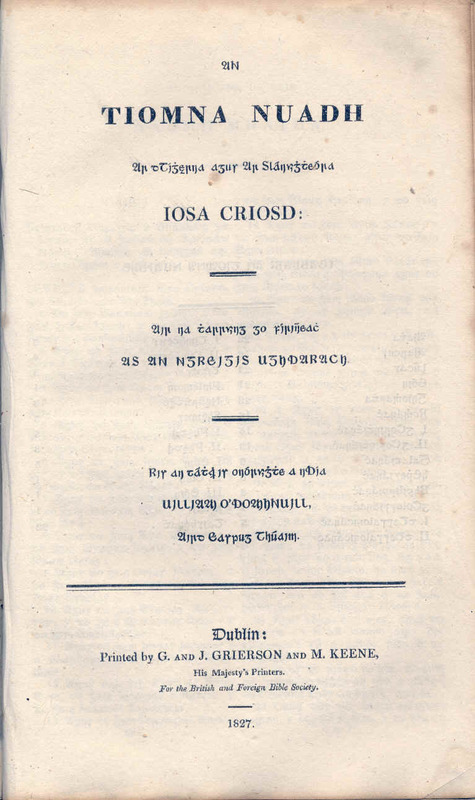 Nicholas Walsh, Bishop of Ossory, who died in 1585, had commenced, with the assistance of John Kearney, to translate the Greek Testament into Gaelic. He had also the assistance of Dr. Nehemiah Donnellan, and Dr. William Daniel, or O'Daniel, both of whom subsequently filled the See of Tuam. This translation, dedicated to King James, and published by O'Daniel in 1603, is still reprinted by the Bible Societies. The first Protestant translation of the Old Testament, made under Bishop Bedel's eye, and with such revision of particular passages as his imperfect knowledge of the language enabled him to suggest, though completed in the reign of Charles I., was not published before the year 1680. It was Bedel, also, who caused the English liturgy to be recited in Irish, in his Cathedral, as early as 1630. The end of eighteenth and beginning of the nineteenth centuries represented a very active period in the production of Irish printing types _____ a consequence of an increased scholarly awareness of the Irish language on the one hand; and, on the other hand, of a renewed enthusiasm for the promotion of the doctrines of the Reformed Church in the aftermath the 1801 Act of Union. 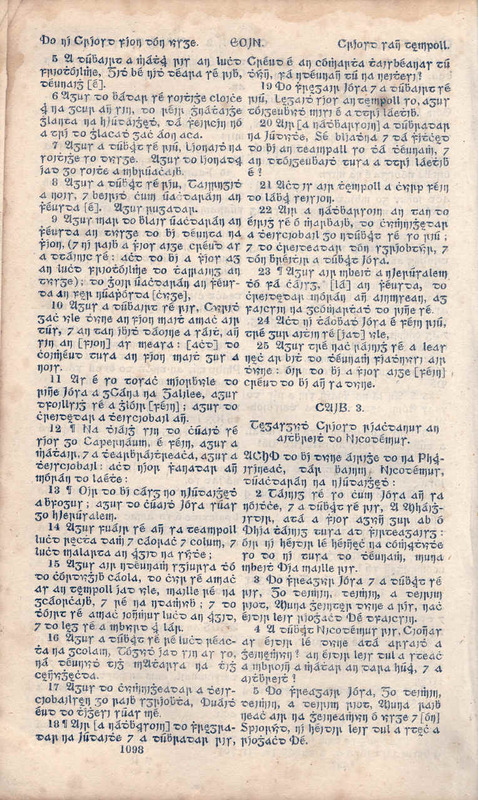 The British and Foreign Bible Society, which in 1814 had begun to issue religious titles in a disparate range of languages and printing types, harboured among its core aspirations the religious conversion of the Irish speaking majority of the population; in 1815, an organ of the British and Foreign Bible Society, the Hibernian Bible Society, agreed that an edition of the New Testament should be published that included an Irish translation in an authentic Irish character.